Six thousand years ago, an unknown and enterprising tradesman of the Elamite city of Susa combined copper and tin in a crucible and ushered in a new age of human development. It was the dawn of the bronze age and the Elamites were the first people to leave the stone age behind. Bronze was the first metal alloy devised by anyone, in Elam or anywhere else, and the technology to make and use it spread outward from what's now Iran and it eventually circled the globe. Its two component metals, copper and tin, almost never occur near one another and making bronze required trade with other civilizations. So ancient people found it to be not only useful, it also made them talk to their neighbors. Bronze had a relatively low melting point, it resisted corrosion, it could be made into as many shapes as could be imagined and it was made from materials that were in ready supply in the Middle East. 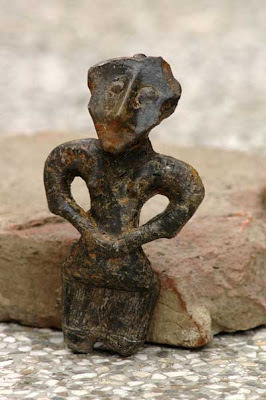 Bronze remained the go-to material until the beginning of the iron age, some three thousand years later. Bronze never lost its usefulness and human beings have been making and appreciating bronze for six thousand years and counting. I can't think of a metal that feels as good as bronze does. It has a nearly velvety feel to it and that comes from the surface corrosion that results from the copper in bronze reacting to oxygen in the air. Bronze has the unique ability to stop corroding as soon as its surface has a layer of copper oxide coating it. It lasts forever and actually looks better over time. 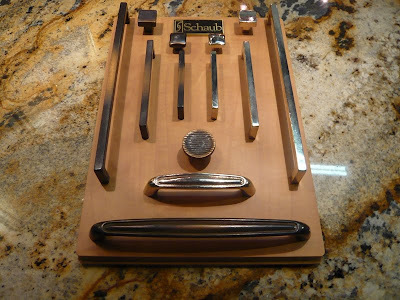 I'm fortunate to sell a line of cabinetry hardware from Schaub and Company in Grand Rapids, MI. Schaub sells some of the finest hardware I can think of and when Tom the Schaub rep comes calling it's like Christmas. Schaub and Company approaches what they do with the care and precision of jewelers and they do a lot with bronze. Tom's visit yesterday afternoon didn't disappoint. This is a collection called Vinci, and it features some pretty modern shapes in an ancient metal. Well sign me up. I knew I was going to love it before he even unwrapped his sample kit. 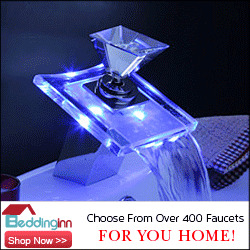 These handles and knobs come in two finishes and the handles come in five sizes. Measured center to center, the handles come in four-inch, six-inch, 12-inch, and 18-inch cabinet handle and then a chunkier 18-inch appliance handle. 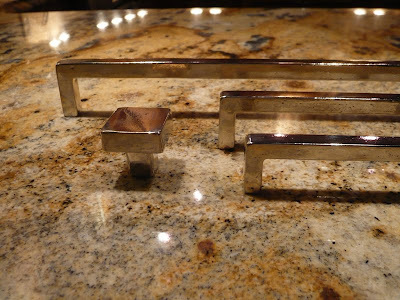 The knobs come in two square sizes and the entire collection is available in two finishes, antique bronze and polished white bronze. 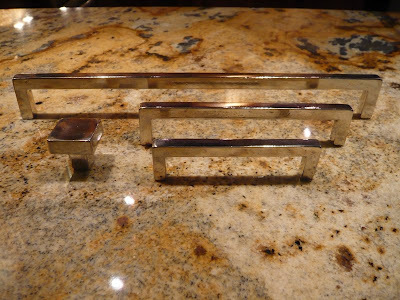 Polished white bronze is an almost mirror finish on a roughly cast modern shape. It's sensory overload and my new favorite handle. As if it weren't beautiful enough already, the entire Vinci collection is unlacquered and has what's called a living finish. I wrote a series on living finishes last winter in response to a reader request that I come up with a definitive answer. I came up with three definitive answers and you can read them here, here and here. A living finish means that the surface will continue to change color with time and exposure to the elements. This takes time and it provides true character to a metal finish. Your life leaves a mark on a living finish and the idea of my leaving a mark on an inanimate, decorative object is something that appeals to me on a really basic level. It's for that same reason that I like marble counters so much. I'll take character over something that looks pristine any day and believe it or not, I kind of like my crow's feet too. Anyhow, this new Vinci bronze collection from Schaub and Company has given me one more thing to love about their hardware. 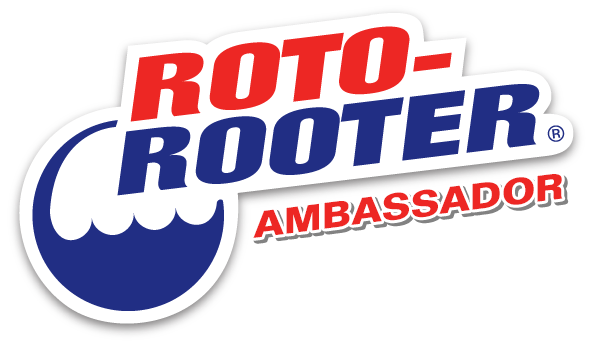 Poke around on their site, there's enough there to appeal to just about everybody. 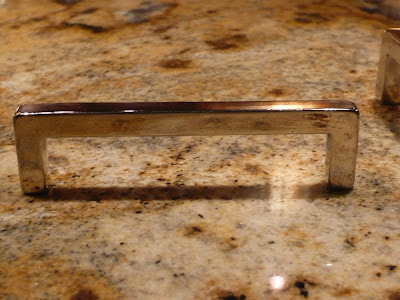 Beautiful bronze hardware :-) I love the look of warm metals -- I'm even warming up to brass, as long as it's brushed and not shiny!! Well, the bronze handles here start at $50 a pop, so there shouldn't be a problem with Brian springing for 50 of them. Hah! 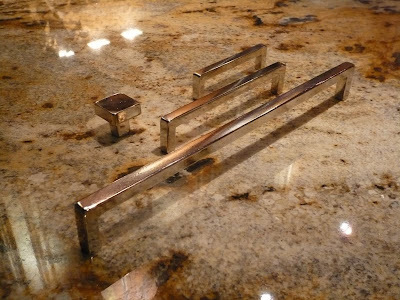 cast bronze mountain, primarily the 4" pull 777-AI with the cup pull for top drawers 775-AI. Oh yes, yummy. I'm with you on living finishes - one person's stain is someone else's patina. It's just best to know which kind of person you are before investing! Rachele, I have used that collection a lot. My enthusiasm for bronze rubs off on a lot of my clients. 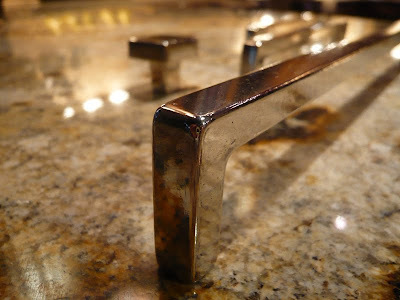 Clarity, I have a quiz for clients to help them figure out if they can handle things like marble or living finishes. I always say that's it's beyond a preference, it's a bona fide personality type.